January decided not to let us off the hook, instead giving us one final snowstorm amounting to another six inches of accumulation here in St. Peter on Monday. Comparing photos of the “backyard” behind the Interpretive Center, it looks like we’re back to or slightly above the level of snow cover (in terms of height) that we last saw in December before the brief post-Christmas thaw. However, the snow cover we have now is likely much more dense than it was a month ago, as it continues to pack down and essentially become a hard, solid crust as temperatures fluctuate. The current outside temperature as I type this is 30 degrees Fahrenheit; this warm-up looks to continue to hover close to the freezing/melting point through Sunday but also is likely to bring more moisture in the form of snow beginning Saturday night and persisting through Sunday. Otherwise next week looks rather sunny, but with low temperatures dipping below zero again (shrug) and highs in the single digits until next Friday. 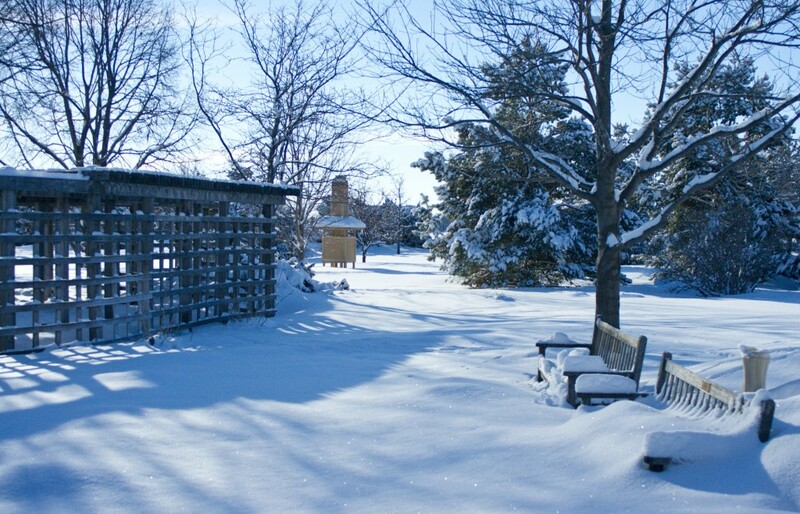 The "backyard" behind the Interpretive Center, 12/17/10. 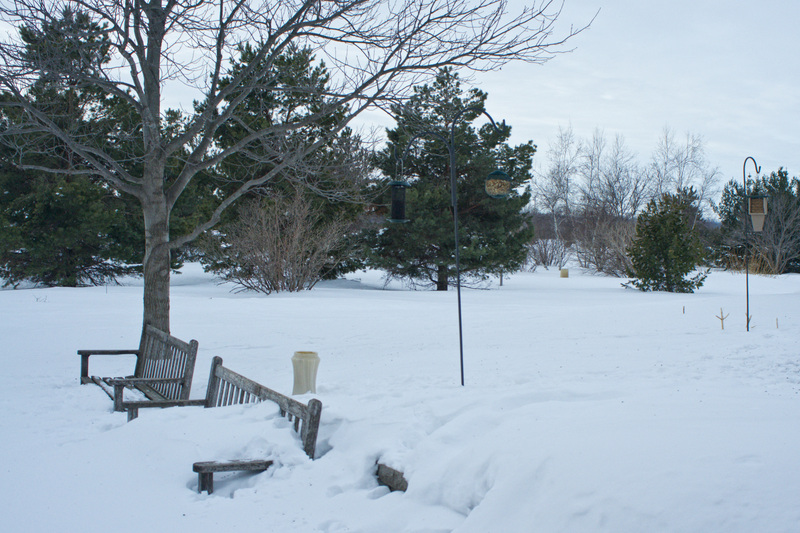 The "backyard" behind the Interpretive Center, 2/4/11. Towns, cities, counties, and the state itself have already begun talks regarding this spring’s flooding potential. Forecasts in early January seemed a bit on the conservative side, saying that there was a chance of only moderate flooding for locations along the Minnesota River. The latest models show a greater chance of moderate to major flooding, leaning toward major. Areas along the Mississippi River (St. Paul) as well as the Red River of the North (Fargo/Moorhead) show similar threats of major flooding. It’s still rather early in terms of the accuracy of these predictions, as any melting we have between now and early March could help alleviate the situation somewhat or, conversely, any more snowfall we see could exacerbate it. But regardless of what happens between now and then, there is A LOT of snow in southern Minnesota, from the Minnesota River’s source out west at Big Stone Lake to its eastern confluence with the Mississippi River in St. Paul, that will ultimately melt and enter the river’s watershed; the question is at what rate will it all do so.